How art, science, and food meet in a Brooklyn test laboratory of maybe-Martian cuisine. One technical challenge of going to Mars is that food spoils over months/years, and humans need to eat unspoiled food in order not to die. It’ll be a short trip if we can’t come up with a way to get three squares a day in minus-80 degree mornings and extreme ultraviolet radiation. No telling, either, how the planet’s exceedingly toxic CO2 levels or its wonky gravity (about a third of Earth’s) will cramp food production. To try to find some answers, The Boiler Gallery in Brooklyn has been inviting visitors to come invent would-be Martian culinary masterpieces in an experimental pantry they call the Menu for Mars Kitchen. It’s stacked with 10 food groups — including proteins, grains, seeds and nuts, starches, fats, and dairy — in hopes that we can stomach the longest road trip ever. 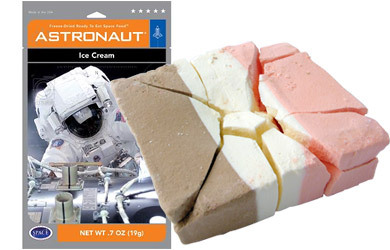 I got curious about how people won’t die on Mars, and I’m fascinated with weird things that people eat in the near or far reaches of space — including but not limited to those astronaut freeze-dried ice cream packets you can get at every museum gift shop. Which is how, on a recent Saturday, I wound up with a helping of mac & cheese packed with crickets. But more on that in a bit. In Brooklyn I found this quasi art installation and test kitchen working up prototype meals with Mars-ready ingredients. (The recipes they create will be packed up and shipped to NASA as goodwill gesture for further red planet research.) After you walk through the main door of the gallery space you pass through two “airlocks” that lead to the kitchen itself. The overall layout — housed in what’s meant to look like a gigantic mylar tent to be set up and stationed on Mars — includes a greenhouse where fast-growing weeds could be easily cultivated, an office to record findings, and a Martian surface gallery where each meal is photographed. Alongside the pantry were tables displaying the dishes that enterprising chefs had made so far: quinoa nut salad, a fermented tea leaf salad, a cheddar-and-swiss pizza with onion that looked like frozen slices you’d stuff into your face at 3 a.m. Also scattered around the gallery were portholes looking out into the vast Martian wasteland, which is technically another mini-art-installation entitled “Big Sky Out There,” created by the kitchen’s co-organizer Heidi Neilson. On the menu that day: “jiminy mac and cheese,” an earthbound favorite with a little added protein jolt from crickets sprinkled in the mix. Heather Kapplow, an artist, and Thalia Zedek, a musician, served as the kitchen’s amateur space chefs for the day. I unfortunately had to miss something called a “Miracle Fruit Tasting, featuring the Astronaut Reviver cocktail” that Zedek and Kapplow were fixing up later. Getting drunk on Mars will have to wait. The macaroni they made was regular out-of-the-box stuff, which could easily survive the fictional Mars trip considering the average shelf life of macaroni is about two to three years and the current unmanned travel time to Mars is about eight months. The dairy ingredients, like the milk and the cheese, were all powdered with a shelf life of five years, and the cricket powder that was added would ostensibly be produced from easily cultivating colonies of the little critters during the fictional trip and after landing. Neilson, an artist and former biology teacher, let me know that there still needed to be room for some leeway in the kitchen. The water used to make the mac and cheese would, on Mars, probably be filtered from urine, which they thankfully didn’t do, and the means to cook the food would come from some sort of electrical induction method they just didn’t have at the gallery. While waiting for Zedek and Kapplow to work their crickety Martian magic, I got to chat with Neilson. She and co-organizer Douglas Paulson — another New York-based artist — began the Menu for Mars on planet Earth as a supper club at different spots around the city. “We met at different restaurants that serve food from a country that has an active space program, and informally discussed what food might be like with someone with relevant expertise like astrophysicists, composters, nutritionists, and gardeners,” Paulson told me. “The supper club attracted a lot of interesting and dedicated people with really different backgrounds, and we decided we should collect our findings and carry out an experiment.” Those different backgrounds coalesced into the idea for a physical kitchen to test out recipes. The supper clubbers began corresponding with people linked to NASA, lending their initial social gathering and artistic inclinations some scientific cred. They served up the idea to Dr. Sian Proctor, a geology professor at South Mountain Community College in Phoenix, who helped out with the kitchen. Proctor previously worked with NASA for the Astronaut Program and participated in one of the HI-SEAS experiments, a NASA-funded analog of Mars missions located in an isolated area of Hawaii which similarly seeks to research ways for humans to survive on Mars. Eventually the group got gallery space and linked up with Flux Factory, a Queens-based non-profit that supports local artists. The Menu for Mars Kitchen, Paulson says, “involves artists, scientists, urban farmers, composers, foodies, chefs, space enthusiasts, and scientists, who all bring their experience to the table.” It takes a village to feed a hypothetical colony. The mac concoction came out brownish. I took a scoop and, surprisingly, Martian mac and cheese with cricket topping tastes like the Earth-standard Kraft staple, a reassuring thing if you’re 140 million miles from home and craving something that’s basically like what mom used to make, albeit when she was feeling kinda second-glass-of-wine lazy. Besides much-needed proteins to get you pumped up for some sick Mars research, the bugs also gave the dish a salty flare. Is this what living on another planet will taste like, in the early years? Astronauts might turn to this recipe in whatever electronic gadget they have beside the convection plate as they stir and look off at the blue dot, covered in potable water that didn’t come out of their bladders 20 minutes earlier. Crickets are still exotic to me, but on Mars, anything with an earthy kick will taste like comfort food.